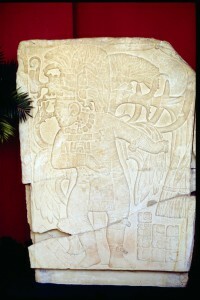 A classic Maya stela, cut into pieces for transport, which ended up in the collection of Sweden’s National Museum. It was returned to Guatemala in 1994.The Maya site of La Amelia was a small polity located in the Pasión River area of the Petén Department, Guatemala. Occupation was brief at La Amelia: the site dates entirely to the Late Classic period (approx. 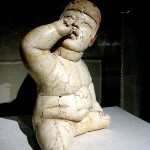 600–800 AD) and it was the first polity in the region to be abandoned around 830AD during the Classic Maya collapse. The site may have originally been called B’ahlam, or ‘Jaguar’, based on inscriptions found at the larger site of Dos Pilas (Guenter 2003: 21). In 1937 a team from the Carnegie Institution headed by Ledyard Smith, H.D. Pollock, and Edwin M. Shook excavated at La Amelia (Graham 2010: 170). Among the monuments they recorded was Stela 1 (also called Panel 1) which was published in Sylvanus G. Moreley’s Inscriptions of Peten (1983). The stela depicts one of the last lords of Amelia, Lachan K’awill Ajaw B’ot, who was born on 25 June 760 AD and enthroned on 1 May 802 AD, as a ballplayer standing upon a jaguar (Escobedo n.d.). Stela 1 was looted from La Amelia in 1965 (IDAEH 1994). Although the stela was found broken into two sections in 1937 (a diagonal break at the figure’s shins), the looters professionally cut the piece under the figure’s feet. This allowed them to transport the much smaller lower register, which depicts a jaguar. The upper pieces of the stela were left behind (IDAEH 1994). Sometime in the late 1960s, Shook revisited the site and found the lower portion of the stela to be missing (Graham 2010: 170). Shook then had the remaining portions of the stela transported to the town of Sayaxché and later to Guatemala’s Instituto de Antropología e Historia for safe keeping (Graham 2010: 170). According to a press release from the Instituto de Antropología e Historia (IDAEH 1994), after it was looted, the lower portion of the stela was smuggled to New York City where it was displayed in the gallery of the late Everett Rassiga. Rassiga was a dealer of Latin American antiquities who was associated with the transport of the Placeres Temple Facade and some Las Bocas-style figurines. The fragment was reportedly in Rassiga’s possession in 1969 when it was included among a list of looted Maya sculptures in Clemency Coggins’ seminal paper on illicit Pre-Columbian antiquities (Coggins 1969). Coggins reported that at some point the bottom portion was lent to an exhibition in Paris where it was temporarily reunited with its upper portion (Coggins 1969: 96). Archaeologist Merle Greene Robertson records that Rassiga did not suspect the fragment was stolen and offered it back to Guatemala if the country would reimburse him the $5,000 he paid for it; Guatemala refused (Robertson 1972: 149). Sometime in the late 1960s or early 1970s the fragment was purchased by Ernest Ericson, a Swedish national involved in shipping, who later brought it to Sweden. After Ericson’s death, the stela fragment became the property of the Ericson Foundation which then donated it to the Swedish National Museum in Stockholm (catalogue number 2285). In 1984, archaeologist Ian Graham identified the fragment as having come from La Amelia (IDAEH 1994). In 1991 the fragment was transferred from the National Museum to the Folkens Museum Etnografiska (People’s Museum of Ethnography) in Stockholm. In March 1994 archaeologist Karl-Herbert Mayer contacted the Folkens Museum Etnografiska, informing them that the stela had been looted, and inquiring about any plans for return. 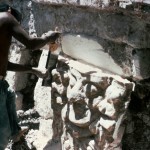 The museum immediately agreed to return the fragment and on 17 April 1994 the stela’s pieces were reunited in Guatemala. This return was hailed by Guatemala as a perfect example of voluntary cooperation in the preservation of Maya cultural patrimony and the return of looted material (IDAEH 1994). Stela 1 is not the only monument known to have been stolen from La Amelia. Over 90 percent of the site has been looted (Foias 1997). In 1937 Shook and his team recorded six hieroglyphic blocks that once formed a monolithic stairway (a seventh was located in 1997). None of the original staircase blocks were at La Amelia by 1997 and they have all presumably been looted (Foias 1997). Special thanks to Karl Herbert Mayer for providing us with information about the stela’s return. Coggins, Clemency C. (1969), ‘Illicit Traffic of Pre-Columbian Antiquities’, Art Journal 29(1): 94–114. Escobedo, Héctor L. (n.d.), ‘Panel 1 de La Amelia’, Information panel. Museo Nacional de Arqueología y Etnología de Guatemala. Foias, Antonia E. (1997), La Amelia Archaeological Project, Final Report: 1997 Field Season. Unpublished report, Williams College. Graham, Ian (2010), The Road to Ruin. (Albuquerque: University of New Mexico Press). Guenter, Stanley Paul (2003), ‘The Inscriptions of Dos Pilas Associated with B’ajlaj Chan K’awiil’, Mesoweb. http://www.mesoweb.com/features/guenter/DosPilas.pdf <Accessed on 2 October 2013). IDAEH (1994), ‘La Estela I de Amelia’, Instituto de Antropología e Historia de Guatemala y Museo Nacional de Arqueología y Etnología. Press release. Morley, Sylvanus G. (1938), The Inscriptions of Peten. (Washington, D.C.: Carnegie Institute of Washington). Robertson, Merle Greene (1972), ‘Monument Thievery in Mesoamerica’, American Antiquity 37(2): 147155. Graham states that it was the upper portion of the stela that was stolen in his memoir; however, it was the lower portion.